2014 Mitsubishi Outlander Pros and Cons: Why (Not) This Car? Remember 1982? While Detroit was fighting for its life, people who wanted to buy a Japanese car had to join a waiting list so they could pay well over MSRP. Seeking a piece of this action, Mitsubishi decided to sell cars under its own nameplate and through its own dealers in the U.S. These cars had been available for a decade as Dodges and Plymouths, but the Pentastar badges had become more hindrance than help. Mitsubishi never did get a big piece of the action. In recent years its sales have been so poor that many people don't even realize the company is still around. Clearly nothing can kill them, or they'd be dead already. Not only is Mitsubishi not dead, but for 2014 the microcompact Mirage returns after a dozen years' absence while the Outlander compact crossover has been redesigned. The latter continues as the only compact crossover offered with a third-row seat in the U.S. Only Kia attempts to pack three rows within a crossover nearly as compact. Pit the Outlander GT against the Sorento SX, and both also promise sporty driving. 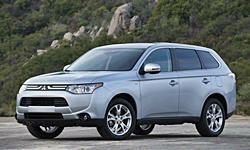 Does the redesigned Mitsubishi have what it takes to win back car buyers from the Korean upstarts? Unconvincing fake wood, dated controls, and bland styling undermine upscale ambitions. 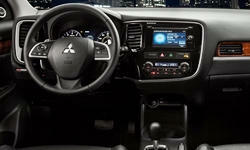 Why the 2014 Mitsubishi Outlander? In many cases, people buy Korean cars because they're cheaper than Japanese cars. But what if they're not? As Kias have improved, their prices have increased. A Sorento SX with all-wheel-drive (AWD) and a third-row seat will set you back $38,850. Want xenon headlights with that? Then it'll be $41,850 for the Sorento SX Limited. All Outlanders now have a third-row seat standard. The $28,620 Outlander GT also includes AWD and xenon headlights. Add the $2,800 Premium Package (for leather, sunroof, premium audio, and a power liftgate) and the $2,375 Navigation Package, and the total still comes to $33,795. This might seem steep for a compact Mitsubishi crossover, but it's over $5,000 less than the Kia. The tested Outlander had the Touring Package, while adds adaptive cruise and lane departure warning to the aforementioned packages and bumps the total to $34,720. Even if the Kia also offered these features--it doesn't--you don't want them on the Outlander. But this is a story for a different place. Bottom line on the bottom line: if you want a quick, leather-trimmed, three-row crossover, the Outlander GT undercuts all of the others by a considerable margin. Kia started picking up momentum when it, like sister company Hyundai, extended the standard warranty to five years, 60,000 miles and the powertrain warranty (for the original owner) to ten years, 100,000 miles. Noting the Koreans' success, Mitsubishi similarly expanded its standard warranty. But without the same effect. Perhaps the new Outlander's most attractive angle. Thoroughly generic. Too many small or obscured buttons. Splendid magnesium shift paddles are wasted in this vehicle. The 2014 redesign reduced the Kia Sorento V6 AWD's EPA figures from 20 mpg city, 26 mpg highway to 18/24.The Outlander GT goes farther on a gallon of gas, especially on the highway: 20/28. Among three-row AWD crossovers, you won't find better fuel economy ratings (though the larger, more powerful Acura MDX comes close with 18/27). Before you start calculating your fuel cost savings, though, consider that premium unleaded is recommended in the Mitsubishi, but not the Kia. The EPA figures assume that the AWD system is in its normal mode. You can also select an eco mode that more completely disengages the rear wheels. In either mode they'll be engaged if the front's slip. You can also select a snow mode or instruct the system to constantly engage the rear wheels. In real-world driving, the trip computer reported low 20s in typical suburban driving, but as high as 30 in Eco mode with a warmed-up engine, a feather-light right foot, and a healthy distance between red lights. On a 70-mph highway, the two-way average was 25.5. At speeds over 60 crossovers often have trouble achieving their EPA highway ratings. Neither the Outlander nor the Sorento has a stylishly swoopy body, so both offer the high seating position and commanding outward visibility that attracts many people to crossovers. Large mirrors compensate for moderately thick rear pillars. Why Not the 2014 Mitsubishi Outlander? There's a reason three-row crossovers tend to be much larger than this pair. The third-row seat in the Kia Sorento doesn't provide enough headroom for the average adult male. Both comfort and knee room are also in short supply. You might think that a seat couldn't get any tighter than the Sorento's third row. But, based on the official specs, the Outlander has nearly four inches less combined legroom--a huge difference. Even children won't fit in the Mitsubishi's third row unless you slide the second row forward much of the way. The 2014's third row seat is at least a conventional seat. Last year it was little more than a sling. In either vehicle the second row split bench is roomy and comfortable, with enough height off the floor to provide adults with good thigh support. But the rear passengers in the Outlander don't get air vents. Those in the Kia do. You'll be hard-pressed to fit more than a single row of groceries behind the third row in either vehicle. The 2007-2013 Outlander could hold much more behind its third-row seat thanks to an unusually low rear cargo floor. That was tossed with the redesign to enable easier to fold, somewhat less rudimentary third-row seats and a flat, level floor. Despite its sloped cargo floor, owing to second-row seat bottoms that don't tip forward, the Kia can hold more stuff with all of the seats folded, 72.5 vs. 63.3 cubic feet. Credit its not-so-compact width, 74.2 inches vs. the Outlander's 70.9. A face that's hard to read. No longer trying to mimic the Evo. Good height off the floor, plus generous legroom when all the way back. The best that can be said of the Outlander's controls is that they include a pair of magnesium shift paddles--that you'll never use. The infotainment interface appears dated, and its small buttons are difficult to operate at a glance. The button for the trip computer (I use this a lot) is obscured by the steering wheel. But at least it doesn't beep at you. The optional lane departure warning system does beep at you--a lot. It's hyper-sensitive, and on by default each time you start the car. The button to turn it off is mounted low, near your left knee. By forcing drivers to take their eyes off the road to deactivate it, this system could cause more accidents than it prevents. The adaptive cruise control could also use a few more rounds of development. Save yourself some hassle and money and skip this option. The 2014 Outlander is quieter and feels more solid than the 2007-2013, but the Sorento is a moving target. Especially on the highway you'll enjoy a more relaxing ride in the redesigned Kia. Around town, ride quality is more of an issue. Don't let the GT badge fool you. The Outlander's suspension is under-damped, and doesn't control body motions well on uneven roads. The Sorento, though fitted with a more compliant suspension this year, better maintains its composure. Love it or hate it, the 2013 Outlander's Evo-like snout at least looked sporty. The 2014's face is merely odd. Move around to the side, and the new Outlander's proportions appear ungainly. The 2013, though actually a couple hundred pounds heavier, looked much more athletic. The chunky new Sorento is no beauty, but it's more attractive than the Outlander. Inside, the Mitsubishi's materials have been upgraded. Unlike the Kia it has an instrument panel that is soft to the touch. But the Outlander's interior doesn't seem as upscale as that in the Sorento. Dated, unimaginative styling without even a hint of sportiness doesn't help. Few manufacturers continue to offer V6 engines as small as the Outlander's 3.0-liter unit without some form of boost. A small six just doesn't provide enough of a bump over an up-to-date four, especially if the four in question is turbocharged. While the Mitsubishi engine is good for 224 horsepower, the Sorento's direct-injected 3.3-liter can kick out 290--more than enough to compensate for a 300-pound weight disadvantage (3,571 vs. 3,894). The Outlander GT is quick is you rev the engine, but well short of thrilling. In casual driving around town acceleration isn't as effortless as in the Kia. Then again, how quick does a compact crossover have to be? Personally, I'm more interested in agile handling. The Outlander GT sounds promising. Under the skin it's related to the legendary Evo ultra-high-performace compact sedan. The S-AWC (super all-wheel-control) system includes an active front differential and torque vectoring. Yet, while these systems effectively counteract understeer, the Outlander GT feels little more sporting than the Sorento SX. There's too much initial slop in the suspension (before it takes a set) and too little feedback through the steering for any fun to be had. Though body motions are better controlled in the Sorento, it leans even more in hard turns, also provides very little feedback, and feels soft. If you're seeking fun handling in a three-row crossover, you'd better start saving up for the far more expensive Acura MDX. Neither the Outlander nor the Sorento provides the entertaining driving experience promised by their GT and SX badges. Either third-row seat provides barely enough room for children of middling size. But, following its redesign for 2014, the Kia at least has the appearance and ride quality of a premium vehicle. The Mitsubishi does hardly anything well. It's more refined than the 2013, but also less interesting. Vehicles don't come much blander in appearance or driving feel than the new Outlander. Even when loaded up the GT's price is thousands lower than the Sorento SX's, but is this enough? For anyone who can afford to spend a little more, probably not. Stronger than a four, but weak for a V6. Good EPA figures. Flat, level load floor with both rows folded, at the expense of 9 cubic feet of cargo volume. Mitsubishi provided an insured car for a week with a tank of gas. Marty Feldman Kia in Novi, MI, provided a Sorento for a test drive. They can be reached at 888-840-1663. 2014 Mitsubishi Outlander pros and cons, according to Michael Karesh: the best reasons for buying (or not buying) the 2014 Mitsubishi Outlander. Join TrueDelta to post your own impressions. I can't believe it was so long ago that I tested this car--four years. See TrueDelta's information for all Mitsubishi models.